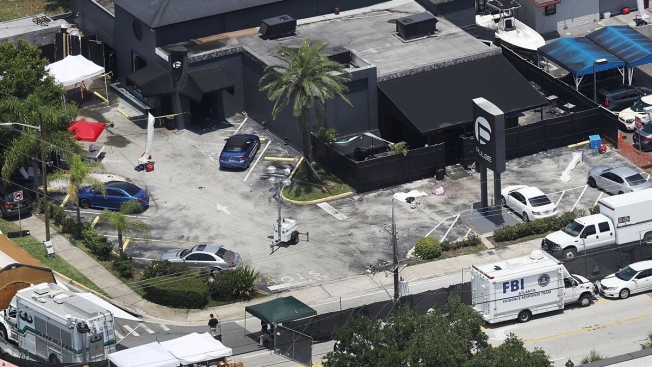 This June 13, 2016, file photo shows the aftermath of the Pulse nightclub shooting where Omar Mateen killed 49 people and himself in Orlando, Florida. Mateen's wife goes on trial in Orlando on Wednesday, March 14, 2018. If jurors in a federal trial in Florida believe government prosecutors, the wife of the man who carried out one of the U.S.'s biggest mass shootings gave a "green light" to her husband when he wanted to execute his terrorist-inspired attack. But if they accept Noor Salman's attorney's account that she was a "devoted mother" with an IQ of 84 and was the victim of Omar Mateen's repeated lies throughout their marriage, they could decide she had no prior knowledge of the attack. Salman went on trial Wednesday in Orlando. The 31-year-old is accused of aiding and abetting her husband in his attack on the Pulse nightclub in June of 2016. She's also charged with obstruction of justice. If convicted, she faces life in prison. 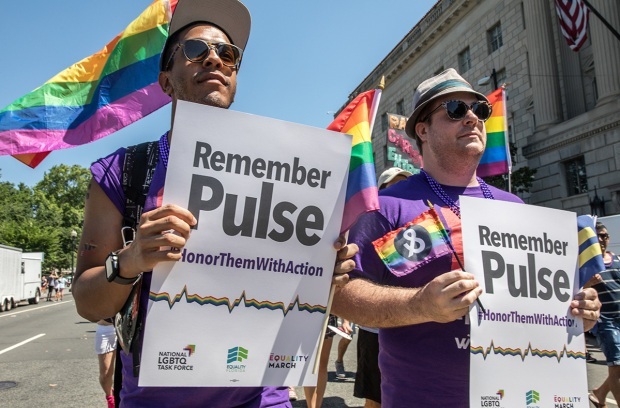 After opening statements, the government called a variety of witnesses who gave emotional testimony about that night at Pulse. Two police officers testified, as did a survivor who said she covered herself with a dead body while Mateen shot his way through the club. Prosecutors also showed video taken inside the club by one survivor; Salman covered her eyes with her hand and victims' family members in the court teared up. Prosecutors portrayed a woman who knew Mateen was buying rounds of ammunition for his AR-15, helped him spend thousands of dollars before the attack and knew about his plan when he left the house in the hours before the shooting. They also say she lied, tried to mislead FBI agents and had knowledge of her husband's sick fascination with violent jihadist videos and terrorism. "None of the victims that night knew the horrific events that would unfold. No one knew except for two people: Omar Mateen and his wife," Assistant U.S. Attorney James Mandolfo said. "The defendant gave Omar Mateen the green light to commit terrorism on behalf of ISIS." In his hourlong opening statement, Mandolfo gave several examples of Salman's conflicting statements to FBI agents in the hours after the attack. In one conversation with authorities, before they informed her of any details of the attack, she said, "My husband is safe with guns." Said Mandolfo: "No one ever told her about guns." He described a wife that knowingly went to at least two locations with Mateen to "scout" sites of potential terrorist attacks. One was City Place, an open-air shopping center in West Palm Beach. The other was Disney Springs, a crowded dining and shopping area near the famed theme parks, Mandolfo said. "What would make people more upset, an attack at a club or an attack at Disney?" Mateen asked his wife, according to Mandolfo. Salman also knew her husband was fascinated with violent jihadist videos, even pulling their 3-year-old away from the screen, Mandolfo said. The statements she made to the FBI after the attack will be key to the trial. Salman's attorney, Linda Moreno, argued in opening statements that some of the claims are contradicted by cellphone records and other evidence. "She cooperated with the FBI completely," said Moreno, adding that her client never asked for a lawyer and consented to a home search. The FBI in their hourslong questioning manipulated and coerced her, Moreno asserts. "Noor Salman denied any knowledge of Omar Mateen's plans for hours," she said, adding that agents told Salman that she could go to jail and not see her child. Her attorney said Mateen had a secret life that involved meeting women online and cheating on Salman. Moreno called Mateen "misogynistic." According to court records, Mateen abused Salman, including when she was pregnant. "The only sin was that she married a monster," said Moreno, adding that the jury can honor the victims of the attack by seeking the truth of her client's actions. U.S. District Judge Paul G. Byron said the trial could last three weeks or more, after taking several days to pick a jury of 12 with six alternates. Mateen, who had pledged allegiance to the Islamic State group, was killed by police in the hours after the shooting. At the time of the attack, it was the worst mass shooting in modern U.S. history. It was surpassed last October by the fatal shooting of 58 people in Las Vegas. Salman was arrested in 2017 in California, where she was staying with family, and has been jailed since then.